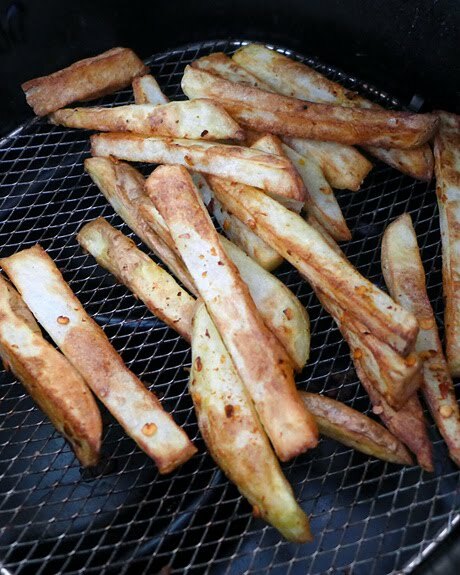 I sat down to write a post about my pizza and bread baking experiments with a few air fryer photos thrown in, but when I went through my last few posts to make sure I wasn't repeating myself, the fry photos attacked me, and I had no choice but to give in and make a batch. At least I know my blog is inspiring somebody, even if it's only me. The fries have a half teaspoon of oil, a sprinkle of coarse salt and too many crushed red peppers. They were delicious, yes, but a little too spicy for me, and now my nose is running. I guess it's a small price to pay for fries-on-demand. I usually make them sans oil but wanted to see if they would be a lot different if I used some. Maybe a little different, but I like them so much plain that I think I'll stick to that method when air frying for myself. 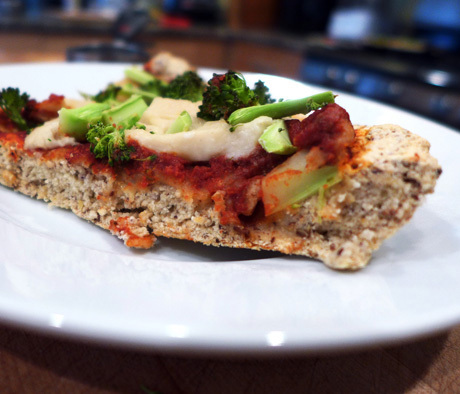 About a month ago I started experimenting again with making gluten-free pizza crust. You can see the results above, topped with mozzarella made from the recipe in Miyoko Schinner's book, The Homeade Vegan Pantry. It was a crust raised with baking powder but not yeast. After I made it I watched a video about applying science to gluten free baking, specifically pizza, and was surprised that I'd added most of the recommended ingredients on my own. I felt so scientific, and intended to take it to the next level, but it never happened. 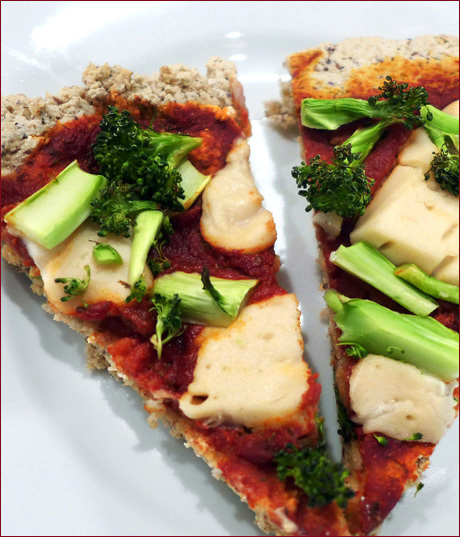 (The ingredients included: Bob's Red Mill GF flour mix, millet flour, coconut flour, psyllium husks, sugar, baking powder, salt, almond flour, flax eggs, water.) Before making the dough, I'd thought about what ingredients I should add, and why I was adding them. The crust was good, but not great. After watching the video, I decided to increase certain ingredients and add additional ones, and now I'm trying to inspire myself to try it again tonight, so perhaps there will be an update soon. Sadly, I don't have homemade mozzarella, but I'll just make a cheese sauce. The aforementioned video said to make the dough very wet, spread it on a pizza pan, bake it in a slow oven for 45 minutes to dry it out, then let it cool while preheating the oven to 425˚F. Add the toppings and bake about 15 minutes. I'll have to watch the video again, but the long, double baking time might exceed my attention span. Perhaps I will selectively incorporate ideas from the video. I discovered an interesting thing about the pizza while heating up the leftovers. 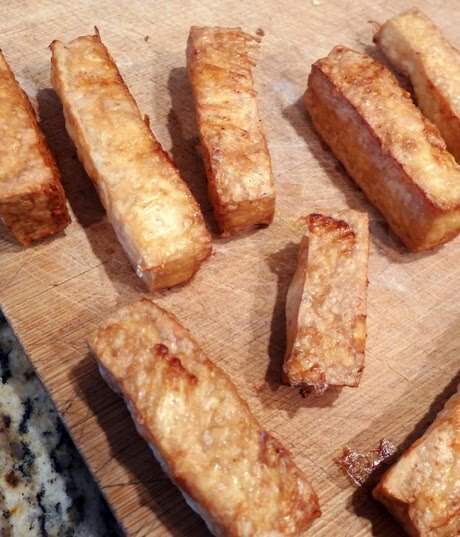 I used my air fryer to heat the leftover slices, and they improved dramatically — becoming crisp on the bottom and chewy inside, just as they should be. Maybe there is something to that scientific double baking time. As for the cheese, it takes two days to make the mozzarella, but once the ingredients are mixed and cooked, it practically makes itself. Most of the time is just waiting for the cheese to ripen. The recipe is called oil-free melty "mozzarella," and I made the sauerkraut juice version. I recommend it, but would probably make the Rejuvelac version next time. 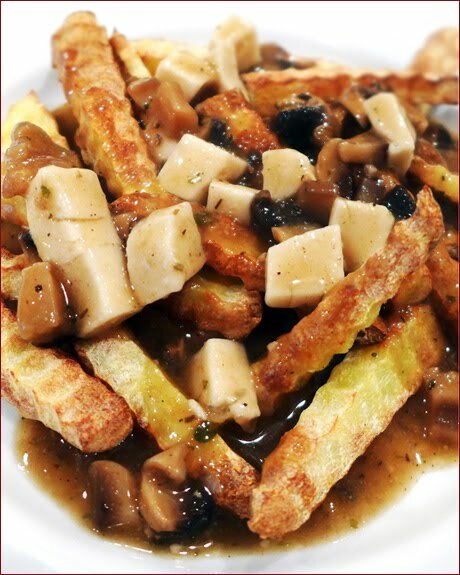 In addition to making pizza with the homemade mozzarella, I also made a vegan version of poutine. I've never actually had poutine made with cheese curds and gravy, so I can't speak to how my version compares, but I can tell you, with mushroom gravy and mozzarella, it was damn fine (as Agent Cooper would say). I swear, if my air fryer ever breaks, I will immediately replace it. 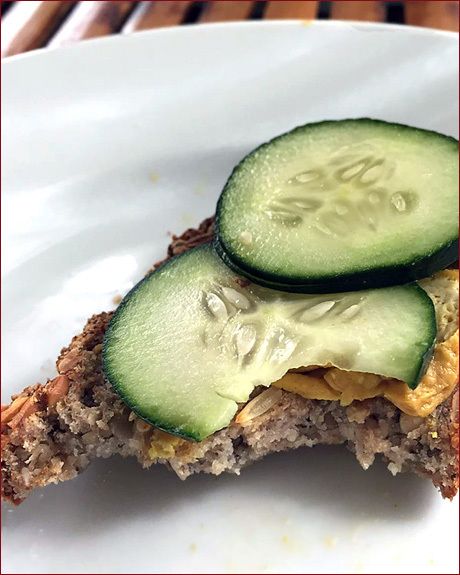 Along with my pizza trials, I revisited the buckwheat-millet nut-and-seed bread that has appeared on the blog periodically — here, here, and here. I've slowly been making changes to the recipe, and when I'm satisfied, I'll post a revised version. The original, unyeasted, naturally leavened loaf is still delicious, but I've been working on a yeasted version in an attempt to make the texture lighter. My husband recently had some dental work done that requires him not to eat nuts or seeds for a month, so the bread is on hold for a couple more weeks. I can't eat the whole loaf by myself. Fancier-than-usual miso soup, or any miso soup, is always welcome at our house. I love to add air fried tofu to miso soup. 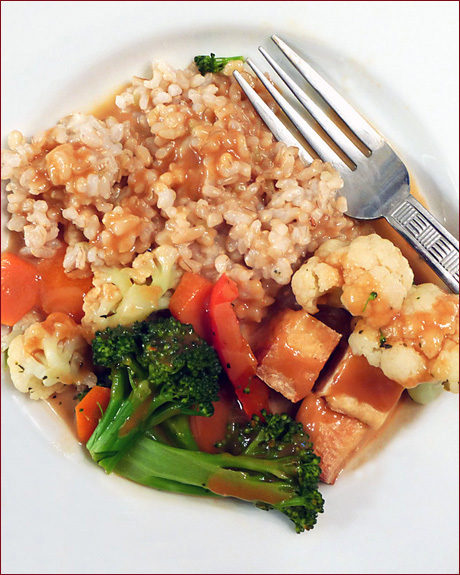 Vegetables and (air fried) tofu with peanut sauce is a fast option when we're too tired or lazy to think of something new for dinner. 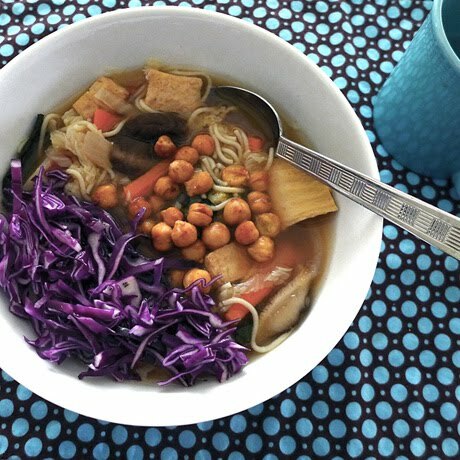 My husband found a recipe called almost instant peanut sauce on the Forks Over Knives Web site that was surprisingly delicious, and turned a simple dish into a wonderfully satisfying meal. My dog is patiently waiting for me to take her for a walk, so I'm going to conclude my post here. I'm working on a cookbook review, and a new product review which I hope to finish soon.